The gloomy economic situation in the euro zone and the deflationary risks it is facing are leading the members of the European Central Bank (ECB) to consider a new round of quantitative easing, as can be seen in recent statements by German, Slovakian and European central bankers. What might this involve, and could these measures be effective in boosting the euro zone economy? Quantitative easing (QE) includes several different types of unconventional monetary policy. To define them, it is necessary to start by characterizing conventional monetary policy. Conventional monetary policy involves changing the key interest rate (the rate for so-called medium-term refinancing operations) by what are called open market operations so as to influence financing conditions. These operations can change the size of the central bank’s balance sheet, including by means of money creation. So there is a stumbling block in distinguishing between conventional and unconventional policy: increasing the size of the central bank’s balance sheet is not sufficient in itself to characterize an unconventional policy. In contrast, strictly speaking an unconventional quantitative easing policy gives rise to an increase in the size of the central bank’s balance sheet but without any immediate additional money creation: the extra liquidity provided by the central bank to the commercial banks serves to increase their reserves with the central bank, so long as these reserves are ultimately used for the subsequent acquisition of securities or to grant loans. These reserves, which are the commercial banks’ safe assets, help to consolidate their balance sheets: risky assets decrease in proportion, while safe assets increase. Another type of unconventional monetary policy, qualitative easing, consists of modifying the structure of the central bank’s balance sheet, usually on the assets side, but without changing the size of the balance sheet. This may mean that the central bank purchases riskier securities (not AAA rated) to the detriment of safer securities (AAA). In doing this, the central bank reduces the amount of risk on the balance sheets of the banks from which it has acquired these higher-risk securities. A final type of unconventional monetary policy involves conducting an easing policy that is both qualitative and quantitative: credit easing, i.e., the size of the balance sheet of the central bank and the resulting risk increase in concert. Unconventional monetary policies that are often attributed to the ECB include operations to provide long-term liquidity (3 years) at low interest rates, as was done in November 2011 and February 2012, and which were described as very long-term refinancing operations (VLTRO). But were these really unconventional large-scale operations? On the one hand, these operations involved not trillions of euros but an amount closer to 500 billion, which is not negligible after correcting for bank repayments to the ECB. On the other, the LTRO operations are part of the ECB’s conventional policy arsenal. Finally, these operations were partially sterilized: the loans granted by the ECB to the commercial banks were offset by sales of securities by the ECB, thereby altering the structure of its assets. So we can conclude that the VLTRO operations were in part “conventional” and in part “unconventional”. The situation is different for the Securities Market Programme mechanism, which consisted, on the part of the ECB, of purchasing government debt on the secondary markets during the sovereign debt crisis. This mechanism led to increasing the size of the ECB’s balance sheet, but also the risk involved: the policy of credit easing has indeed been an unconventional policy. Given the different definitions of unconventional policy in current use, it is helpful to recall that the ECB explicitly indicates the amounts it has agreed within the framework that it sets for its unconventional policies, which are called Securities held for monetary policy purposes. These amounts are graphed in the figure below. They show the frequency and magnitude of the monetary activities that the ECB itself defines as unconventional. 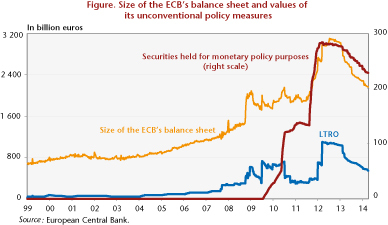 The three different measures shown in the figure (size of the ECB’s balance sheet, LTRO amounts, and amounts of Securities held for monetary policy purposes) are expressed in billions of euros. The first two went up in the fourth quarter of 2008 after the bankruptcy of Lehman Brothers, whereas the third measure of unconventional policy started only in June 2009. We then see a new joint deepening of these measures at end 2011. Following this episode, the amount of LTRO operations came to 1090 billion euros, which represented about 50% of euro zone GDP (2,300 billion euros), i.e., about one-third of the ECB’s balance sheet, while the amount of Securities held for monetary policy purposes was only 280 billion euros, or 13% of euro zone GDP, about a quarter of the LTRO operations. It is interesting to note that the ECB’s monetary policy, which depends on the banks’ demand for liquidity, changed in 2013. One can interpret the reduction in the balance sheet size as a sign of a less expansionary policy or as a reduction in the demand for liquidity from the banks. In the first case, this would indicate that the strategy for ending the monetary easing policy probably came too early in terms of the European economy – hence the recently evoked recourse to new unconventional measures. Until then, these measures had been formally introduced to restore the channels for transmitting the ECB’s monetary policy to the real economy, channels that in some euro zone countries have been scrambled by the financial crisis and the euro zone crisis. The way to restore these channels was to inject liquidity into the economy and to increase the reserves of the banking sector in order to encourage banks to start lending again. Another objective of these policies was to send a signal to investors about the central bank’s ability to ensure the stability and sustainability of the euro zone, as reflected in Mario Draghi’s famous “whatever it takes”  statement on 26 July 2012. In a recent working paper with Mathilde Viennot, we consider the effectiveness of conventional and unconventional policies during the financial crisis. We estimate how much the conventional instrument and the purchases of securities held for monetary policy purposes under the ECB’s unconventional policies have affected interest rates and the volumes of new loans granted in various markets: loans to non-financial corporations, to households and on the sovereign debt market, the money market and the deposit market. We show that unconventional policies have helped to reduce interest rates on the money market, on the government securities market and on loans to non-financial companies. These policies have not, however, affected the volume of loans granted. At the same time, it turns out that the conventional instrument, whose lack of effectiveness was one of the justifications for implementing unconventional measures, had the expected impact on almost all the markets surveyed, and more so in the southern euro zone countries than in the northern ones on the market for 6-month sovereign debt and for real estate loans to consumers. So it seems that unconventional policies have had a direct impact on the sovereign debt market as well as indirect effects, helping to restore the effectiveness of the conventional instrument on other markets. One of the reasons that helps to explain the weak impact of both instruments on the volumes of loans granted is the need facing the commercial banks  to shed debt and reduce the size of their balance sheets by adjusting their portfolio of risk-weighted assets, which has pushed them to increase their reserves rather than to play their intermediation role and to demand relatively higher compensation for each exposure taken. Though legitimate, this behaviour is affecting the transmission of monetary policy: interest rates fall but lending doesn’t restart. It thus seems important that monetary policy is not based exclusively on the banking sector. If there is a new round of unconventional operations, it should be focused directly on the acquisition of sovereign or corporate debt in order to bypass the banking sector. This workaround would undoubtedly lead to amplifying the transmission of monetary policy to the real economy. And it would be welcomed for helping to avoid the risk of deflation in the euro zone. The reasoning behind unloading debt also applies to their customers: the non-financial agents. See the post by Christophe Blot on this subject as well as the recent Council of Economic Analysis (CAE) report by Agnès Bénassy-Quéré, Pierre-Olivier Gourinchas, Philippe Martin and Guillaume Plantin. ← Towards a better governance in the EU?